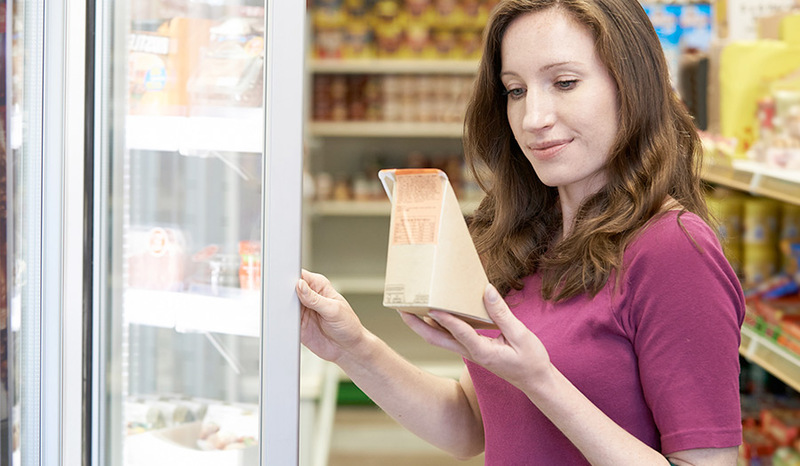 Your “Healthy” Supermarket Lunch Deal Contains 30 Teaspoons of Sugar! Contains 30 Teaspoons of Sugar! It's a daily occurrence, people head out to their local supermarket at lunchtime to pick something quick and tasty to fill their tums, and most don't even bat an eye. After all, grabbing a sarnie and a bottle of juice is way better for you than chowing down a greasy burger from Maccy D's – right? Well, truth be told, a new study has shown that this may not be the case. 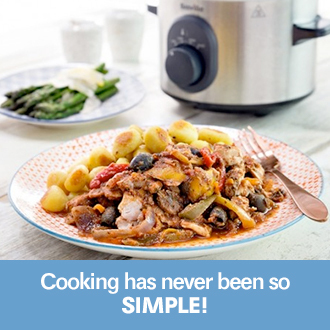 According to researchers at the Queen Mary University of London, the common lunchtime meal deal may contain up to a whopping 30 teaspoons of sugar – 23 teaspoons above your RDA of seven! No it's not all found in your Roast Chicken Salad Sandwich, but rather the extras you can purchase along with it including sugary drinks, chocolate, sweets and crisps. 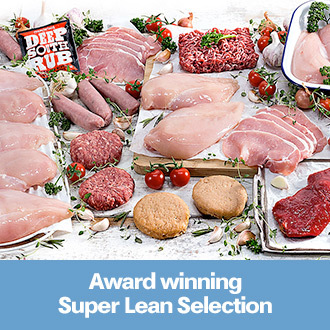 This is why health campaigners at the Queen Mary University of London known as Action on Sugar are pushing for supermarkets and high street stores to remove such items from their meal deals in order to help people get, and stay, healthy. Strong words from Professor Graham MacGregor - Chairman and Professor of Cardiovascular Medicine at Queen Mary's. What happens to your body after a night of Christmas binge drinking? Is your new year diet a fad? 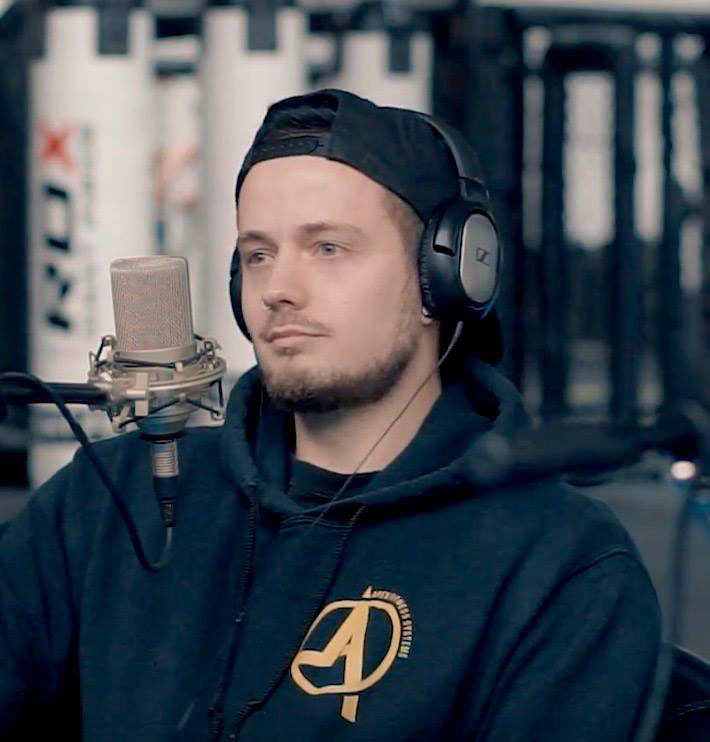 Matt Cooper is an MNU certified nutritionist and lead nutrition coach for Apex Fitness Systems in Bristol. He has worked with hundreds of clients, both online and in person, ranging from stay at home mums to professional athletes. In fact, one of Tesco's most popular deals is the Smokehouse Pulled Chicken sandwich with Mesquite Style Sauce, a 500ml can of Monster and a Mars Duo Bar. Eat this everyday Monday to Friday and you will happily tuck into a mind-boggling 150 teaspoons of the sweet stuff – that's 595g, more than a 1lb bag. 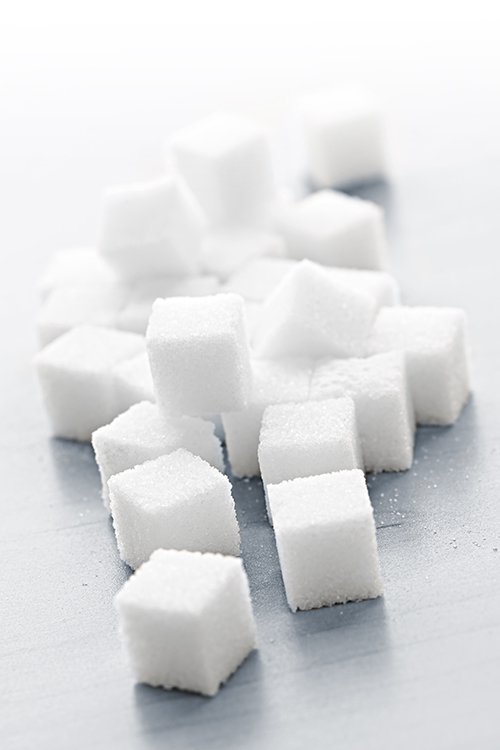 72% of drinks included in Morrisons lunchtime meal deals are “high” in sugar. Boots sell more sugar added Ribena than flavoured water, and Marks & Spencer's boast similarly worrying deals despite fancy packaging portraying a “healthy” option. 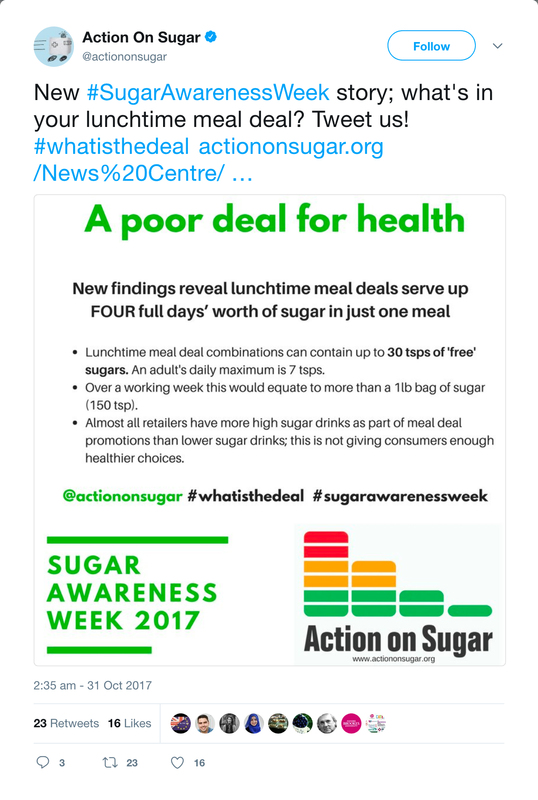 The thing is, there's nothing inherently wrong with choosing a meal deal per se and you can absolutely make sensible low-sugar choices, but Action On Sugar believe the retailers should make it easier to do so. Rather than stocking shelf after shelf with cans of Monster, pack them with fizzy flavoured water. Instead of rows of crisps, how about rows of snack sized packets of nuts? Instead of cartons of chocolate bars, why not offer a wide variety of nut bars, protein bars or clean fruit bars? Of course, the onus isn't completely on the retailers. While consumers are aware of high calorie content, not many actually think about sugar intake, which is a problem. 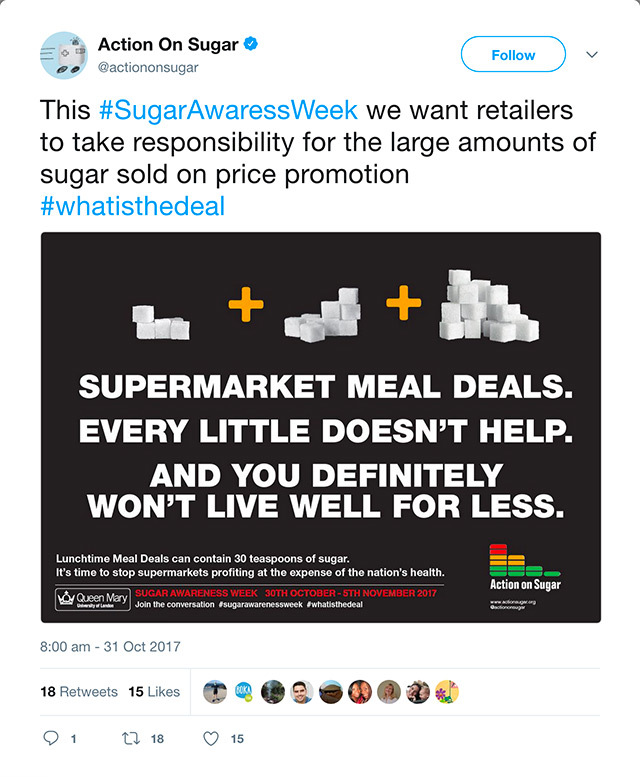 This year's Sugar Awareness Week highlights just how much sugar is included on price promotion, which has been proven to make people buy more. The government has been running scared of the food industry for far too long, having eliminated price promotions from last year's Childhood Obesity Plan. There's no doubt these statistics are shocking, but do you believe the supermarkets, and government, should take more responsibility for the health of the nation? Or, should a person's health rest solely with the individual? 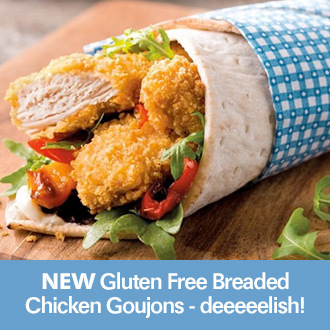 Snack yourself happy with our NEW Gluten Free Breaded Chicken Goujons - deeeeelish!